Last weekend fans in Northern Ireland were treated to a Star Wars film convention at the Eikon Complex in Co Antrim. Thousands of fans visited the convention over the course of the weekend. Fans were able to see life-sized replica props, along with sets and iconic characters - such as stormtroopers and Darth Vader on the set. Some celebrity guests were also in attendance, namely Admiral Piett (Kenneth Colley) and Logray the Ewok (Mike Edmonds). Emerald Isle Garrison in aid of Make-A-Wish UK were the co-ordinators of the NI convention. 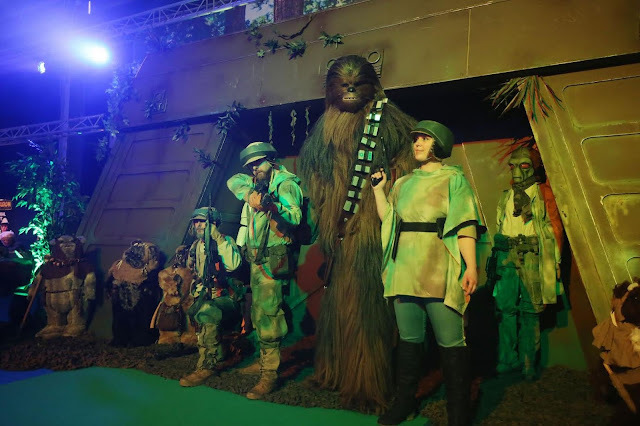 A number of photos were uploaded on the site - Belfast Live - which show the force was strong with this Star Wars event.